Rich soil with plenty of compost added. Often grown in widely spaced enriched hills, or in layered compost heaps that include some soil. After plants set fruit, feed twice, at two week intervals, with a water soluble plant food. Corn, Melon, Beans, Nasturtium, Oregano, Marigold and Monarda. Sow seeds 1 inch deep in hills spaced 6 feet apart. After 2 weeks, thin to 2 plants per hill. Fruit size varies with variety. 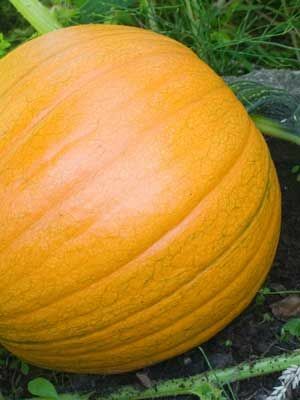 Small "pie" pumpkins are easy to grow and produce nutritious, flavorful flesh. When the plant die back or before freezing weather, cut pumpkins leaving a stub of stem attached. Wipe clean and store indoors. Squash bugs, squash vine borers and cucumber beetles can be formidable pests. Cover young plants with row covers to exclude them.